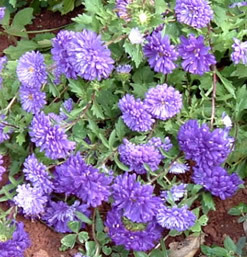 The large China Asters are the most common form grown by florists and gardeners. Native to Asia, this lovely flowering annual is worth the little extra effort it takes for growing. It is a popular ornamental plant in gardens, and numerous cultivars are available; the cultivars are grouped by size, with very dwarf (up to 20 cm), dwarf (20-40 cm), intermediate (40-60 cm) and tall (60-80 cm). 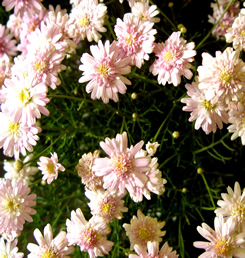 Most species of aster are perennial and generally bloom in August. They have daisy-like or star-like flower heads (4-6" in diameter) with a yellow center on leafy, often tall, stems. The leaves are alternate, 4-8 cm long, ovate, and coarsely toothed. The flowerheads are variable, with either all ray florets or an outer ring of ray florets surrounding central disc florets. Their colors vary from white to creamy yellow, pink, blue, red and purple. They do well in beds, borders or pots and are a favorite as cut flowers because of their longevity. Ostrich Plume, Comt, Poornima,Kamini,Violet cushion, etc. 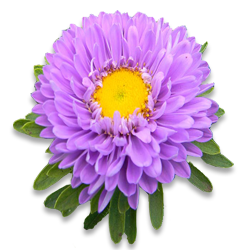 Asters need fertile, sandy, well-drained soil and full sun. The propagation is through seeds. Before sowing, sterilize the seeds with organic mercuric compounds to prevent stem rot and damping-off. For sowing of seeds, it is best to use a shallow flat. Add one-forth well rotted manure and enough sand to the soil to prevent the soil from becoming hard. Fill the flat half or two-thirds full, water thoroughly, and finish filling with soil just moist enough to handle nicely. Sow the seed in rows 2 inches apart, cover with fine sand and press firmly. The wet soil in the bottom will furnish enough moisture so that the boxes will not have to be sprinkled until after the seedlings are up. The seeds will germinate in a little over a week. As soon as several true leaves have grown, the seedlings should-be transplanted for transplanting, prepare the main field by ploughing the land three to four times. FYM is applied @ 10-15 t/ha and mixed well with the soil. Chemical fertilizers @ 90 kg N, 120 kg P2O5, 60 kg K2O per ha are required as basal dose. Seedlings of four weeks are transplanted at a spacing of 30 cm x 30 cm. The crop has to be to be top dressed with 50 kg N at 40 DAT. The crop has to be irrigated once in 4-5 days depending upon the soil and weather conditions. Earthing up has to be done twice at 30 days intervals. Use rich soil in the bottom of the flats and ordinary soil above as further protection against disease. Set the seedlings 3 to 9 inches apart depending on the variety. The plants will grow to a height of 6-10 inches to 3 feet and a width of 6-18 inches. Since they are prone to wilt disease, virus diseases, foot rot, root rot, and aphids, avoid planting in the same location year after year. Pinch off faded flowers and yellowing foliage regularly to encourage new blooms. Shading plants prevents injury from the tarnished plant bug and yellows. 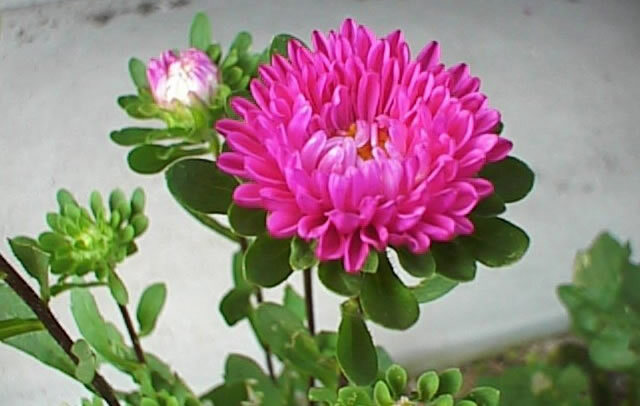 If plants are badly diseased, burn them and stop growing China-asters for a few years. Water well in dry weather.